Perry Street was originally named Beaver Street by Joseph Ellicott in the original 1804 Plan of New Amsterdam/Buffalo. In 1907, Alderman Hendrick Callahan suggested new names for a bunch of streets. The streets that he renamed were Liberty, Erie, Columbia, and Perry. He also suggested renaming Main Street to Iroquois Avenue; however, this was not approved. Liberty Street was later renamed Baltimore Street. Perry also lends his name to the Commodore Perry projects, located near Perry Street. 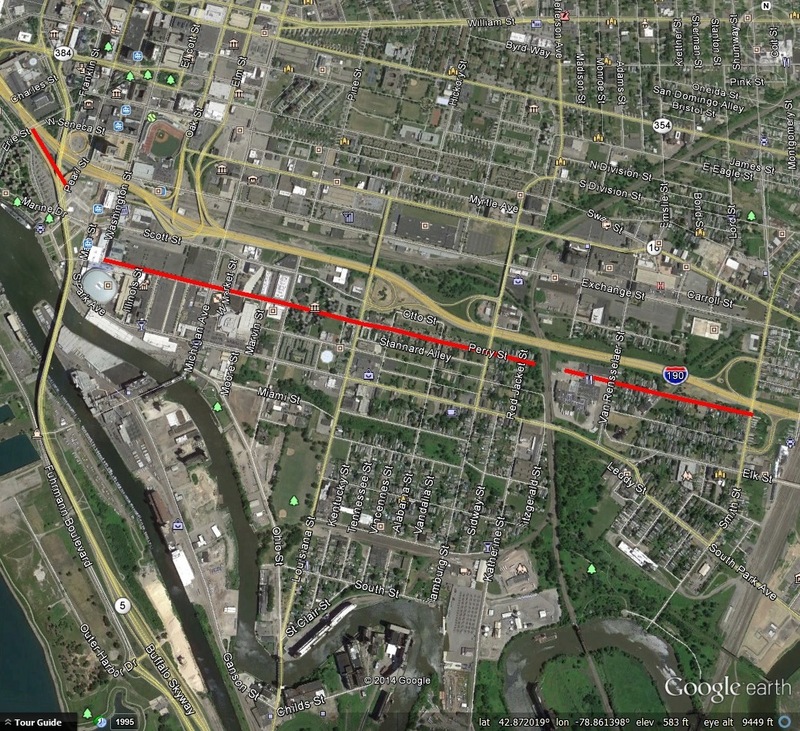 Additionally, Perry Boulevard used to be located along the former route of the Erie Canal where the I-190 Thruway is currently located. The road led from Main Street up to Porter Avenue, and was constructed when the canal was filled in during the construction of the Lakeview Housing Project. At the time, the unused canal bed was considered a health hazard, so it was filled in to protect the residents of the public housing. A short portion of the roadway under the Thruway is still called Perry Boulevard. Oliver Hazard Perry was born in 1785 in Rhode Island. His younger brother Matthew Calbraith Perry was involved in the opening of Japan. 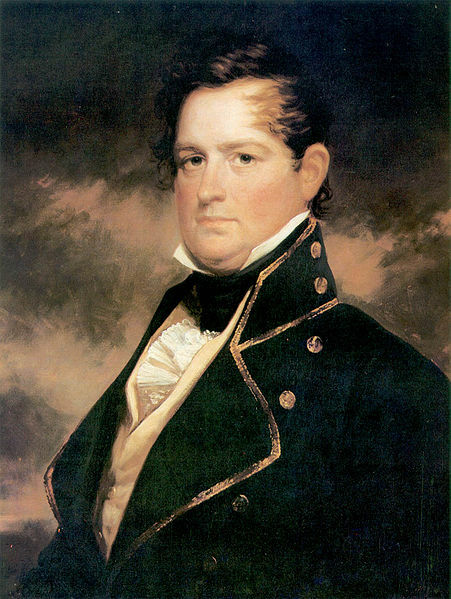 Matthew Perry also served under his brother during the Battle of Lake Erie. Perry served in the West Indies, the Mediterranean, and the Caribbean, but he is best known as the “Hero of Lake Erie” for his role during the War of 1812. 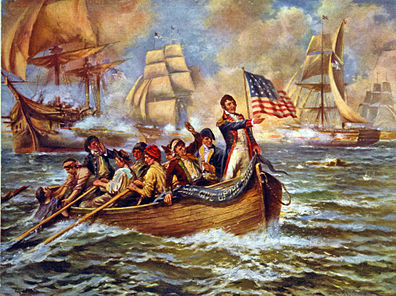 At the start of the War of 1812, the British Navy controlled the Great Lakes, except for Lake Huron. The American Navy controlled Lake Champlain. The American Navy had only a small force, which allowed the British to make advances on the Great Lakes and northern New York waterways. Perry was named Chief Naval Officer in Erie, P.A., and built a fleet on Presque Isle Bay. On September 10, 1813, Perry fought a successful action during the Battle of Lake Erie. During the battle, Perry’s ship, the USS Lawrence, was severely disabled. 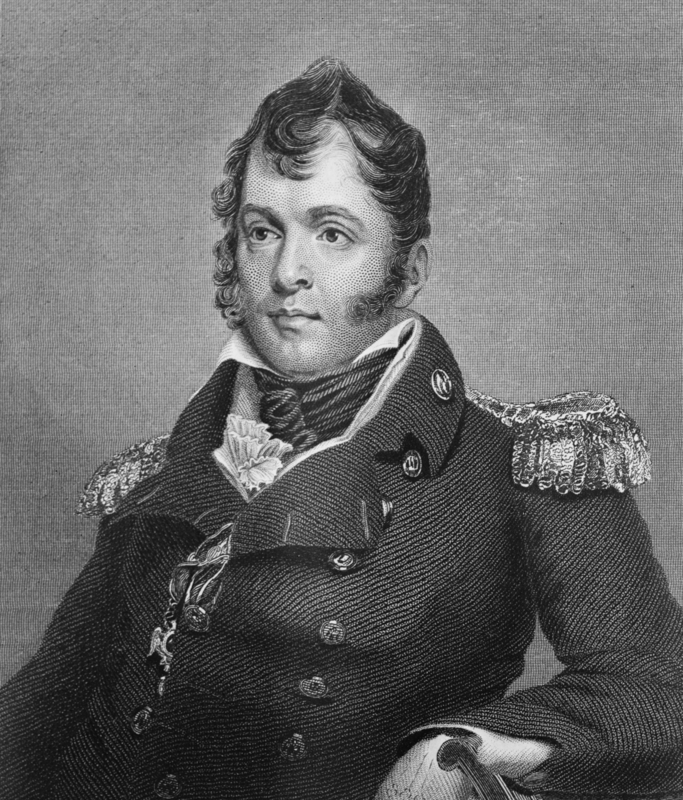 the British Commander, Robert Barclay, thought Perry would surrender. Commander Barclay sent over a small boat to request that the Americans pull down the flag. Perry remained faithful to the phrase “DON’T GIVE UP THE SHIP”, which were paraphrased from the dying words of Captain Lawrence, Perry’s friend and the ship’s namesake. The men rowed through heavy gunfire to transfer to the USS Niagara. Perry’s forces continued until Barclay’s ships surrendered. Although Perry was aboard the Niagara during the fighting of the battle, he had the British surrender on the deck of the Lawrence to allow the British to see the price his men had paid. Perry’s report following the battle was brief but became famous: “We have met the enemy and they are ours; two ships, two brigs, one schooner and one sloop”. This was the first time in history that an entire British naval squadron had surrendered. He was awarded a Congressional Gold Medal and for his role during the Battle of Buffalo. He also helped completed successful outcomes at all nine Lake Erie military campaigns, which was a turning point during the War of 1812. The Perry statue in Front Park was erected by the State of New York Perry Victory Centennial Committee. The statue was dedicated at the 100th annual reunion of the New York Veterans Association. The statue has recently been restored and returned to the park, along with cannons that were originally located in the park due to the park’s connection to Fort Porter, which was located near where the Peace Bridge plaza is currently located. Commodore Perry did not live to old age. He died in 1819, on his 34th birthday, of yellow fever while at sea. He was buried at Port of Spain, Trinidad with full military honors. In 1826, his remains were moved to Newport, Rhode Island. Learn about the origins of other street names by checking out the Street Index. The Porter family was very influential in Buffalo/Niagara during its formation and early years of settlement. There is Porter Ave in Buffalo, Porter Road in Niagara Falls, a Town of Porter in Niagara County and the Porter Quadrangle complex at University of Buffalo. 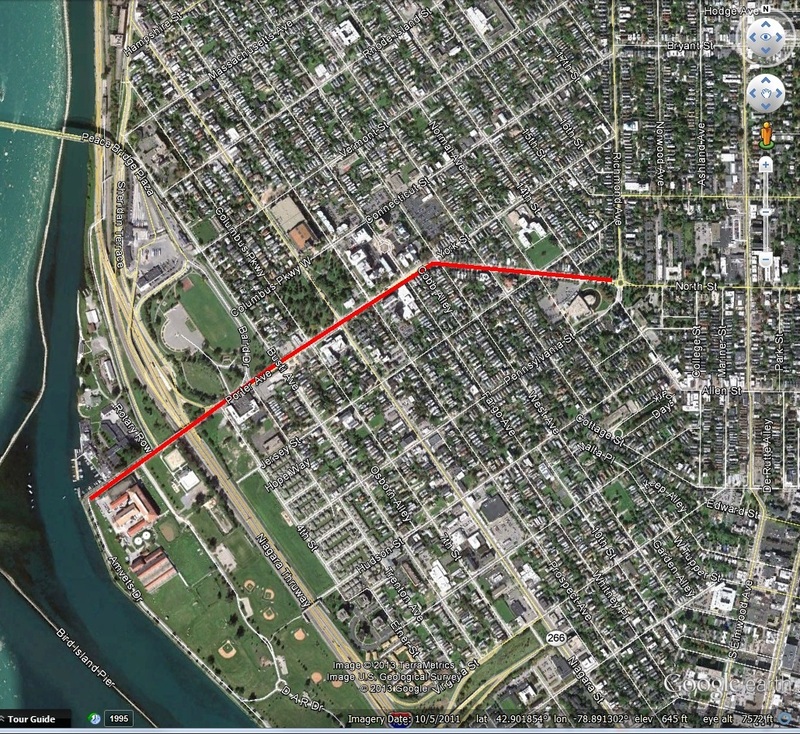 Porter Avenue is located in the Front Park neighborhood on the West Side of Buffalo and is an Olmsted Parkway. 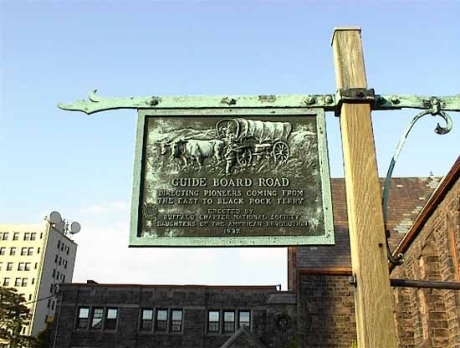 The street was originally known as Guide Board Road and predates Joseph Ellicott’s time in Buffalo. It was an Indian Trail used during the Revolutionary War to a ferry which led to Canada. The original street alignment went straight west towards the Niagara River. When Frederick Law Olmsted designed the City’s parkway system, he decided to turn a portion of York Street into Porter Avenue, in order to connect to Front Park and Fort Porter. This allowed the connections between parks that completes our parks system. 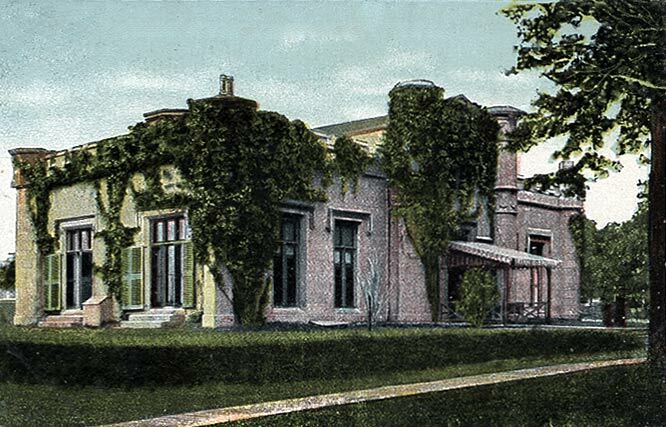 The former Fort Porter was located on the Lake Erie shoreline just north of Front Park. Olmsted included the Fort’s grounds into his original plans for Front Park. The Fort was torn down to build the Peace Bridge. The Porter Family included Augustus and Peter Porter. Augustus was prominent in Niagara Falls, living on and owning Goat Island His brother Peter Porter was prominent in Black Rock/Buffalo. Peter Buell Porter was born on August 14, 1773 and was raised in Connecticut. He attended Yale and Litchfield Law School. He moved west to Canandaigua for his law practice in 1793. He served as Clerk of Ontario County from 1797 to 1804 and was elected to the New York State Assembly, representing Ontario and Steuben Counties in 1802. While in the Assembly, Peter Porter was influential in working with Joseph Ellicott to promote road construction in Buffalo. However, shortly thereafter, Peter Porter began to develop a community two miles north of Buffalo called Black Rock. At Black Rock, there was what was called a “safe and commodious” natural harbor, and the land was owned by New York State, unlike the majority of Western New York which was owned by the Holland Land Company. Peter purchased land with his brother Augustus and Benjamin Baron to form Porter, Barton and Company. New York State gave their trading firm a monopoly of the transportation business on the portage around Niagara Falls and it handled much of the trade on the Upper Great Lakes. Around 1797, Joseph Ellicott tried to convince Porter and his friends to purchase property from the Holland Land Company. Instead, they bought state lands along the Niagara River. The laid out a town site, built warehouses and other trading facilities, establishing Black Rock. This angered Paul Busti and other Holland Land Company agents, who then tried to purchased land from the State for the Holland Land Company in order to sabotage Porter’s plans. As the town of Black Rock developed, the Holland Land Company tried hard to push Buffalo’s interests by using political influence in Albany. However, Porter was equally determined to make Black Rock successful and had his own power in Albany. Peter Porter moved to Black Rock in 1809 and was elected to the US House of Representatives, furthering his influence from Albany down to Washington, D.C. He was so influential as a congressman that he convinced President Madison to move the customs house from Buffalo to the smaller Black Rock during summer (the more active) months. During the War of 1812, General Porter served in the New York State Militia. In congress, Porter was labelled a War Hawk as he fought for security of the Niagara Frontier as the conflict leading up to the war became heated. He found strong allies in Henry Clay and John Calhoun and was named chair of the Foreign Affairs Committee. Porter was presented a gold medal from Congress on November 3, 1814 for “gallantry and good conduct” during the Battle of Chippewa, Battle of Niagara and Battle of Erie. Following the War of 1812, Porter was able to assist in getting the War Department to use federal troops to repair and improve roads between Fort Niagara and Black Rock which were damaged during the war. Porter also brought federal funds to the area to build roads and canals. Porter and his supporters also wanted the federal government to build roads from the “Buffalo Frontier” to Washington to foster trade between the federal capital, the Atlantic Coast and the Great Lakes. This led to conflicts between Black Rock (which was Peter Porter, because of his vast real estate holdings and commercial enterprises) and Buffalo’s leaders – including Samuel Wilkeson, Albert Tracy, David Day and Oliver Forward. Buffalo’s leaders were on the side of Dewitt Clinton, Mayor of New York City at the time. Porter and his friends were on the anti-Clinton political faction. General Peter served as Secretary of State of New York from 1815 to 1816. During a special election after the resignation of Governor Tompkins, Tammany Hall printed ballots with Porter’s name on them. Porter received 1300 votes, despite not running for office. Governor Dewitt Clinton won that election, despite Tammany Hall’s efforts. General Porter was appointed to the Canal Commission created to examine possible canal routes. Governor Clinton opted for a Hudson River to Lake Erie straight across the state. General Porter preferred two canals, one joining the Hudson River with Lake Ontario and one around Niagara Falls, joining Lake Erie and Ontario. Buffalo Leaders and Joseph Ellicott preferred Clinton’s ideas, but in 1814, it seemed that the Canal Commission might adopt Porter’s suggestions. By 1816, Porter had not been reappointed to the Canal Commission as he had accepted the office of boundary commissioner to clarify the disputed sections of the US-Canada Border. Joseph Ellicott replaced Porter on the Commission, Dewitt Clinton had been elected Governor, and the Erie Canal took the alignment we are familiar with today. The rivalry then shifted to whether Buffalo or Black Rock would be the western terminus for the Erie Canal. Black Rock had a large, natural harbor which would be easy to expand and for years it had been the center of east-west trade and was used even by the merchants in Buffalo. Black Rock also provided an escape from the turbulent winds and swells coming across Lake Erie. It also would shorten the canal a few miles, lowering construction costs. Buffalo had advantages too: it was out of the range of British canons on the Canadian Shore (which was important given the recent War with Great Britain). Higher water levels meant the canal would feed better in Buffalo. Samuel Wilkeson led the charge, along with a group of enterprising men, determined to make Buffalo the canal terminus. A report by engineers stated that the terminus should be located in Buffalo as the Black Rock harbor was too vulnerable to British attack, too exposed to ice damage and too expensive to develop. While several later reports supported Black Rock, the Canal Commission designated Buffalo as the canal terminus in 1822, on the advice of four out of five of its engineers. Efforts by Porter and his friends to alter the decision were fruitless, and bills were passed in the legislature for a canal link from Tonawanda to Buffalo, completely bypassing Black Rock. General Porter built a house at 1192 Niagara Street (between Breckenridge and Ferry) in 1816. He Porter married Letitia Breckenridge of the prominent Breckenridge family. Breckenridge Street, which was originally called Commerce Street, is named after her. When Grover Cleveland moved here to Buffalo, he lived in the Porter house, with his Aunt and Uncle, the Allens. Peter and Letitia’s son Peter A. Porter went on to become a Civil War Colonel, killed in the Battle of Cold Harbor in 1864. General Porter donated the land for the Union Meeting House Church across the street from his house. The church is located at 44 Breckenridge and is also known as the Breckenridge Street Church. Peter Porter was also President of Jubilee Water Works, the first company to bring water into people’s homes. The water came from the jubilee spring (located in present day Forest Lawn…Crystal Lake is formed from waters from the spring) and was pumped through wooden pipes. Some of Buffalo’s wooden water pipes still exist. In 1837, Black Rock was dealt another blow when General Porter sold his interests there and moved to Niagara Falls where he built a new home. Peter Porter died in 1844, and Fort Porter was named in honor of the businessman-politician-soldier. 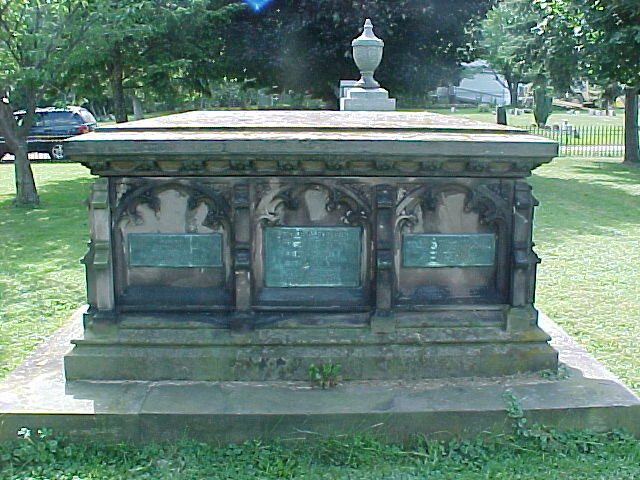 Peter and Augustus Porter are both buried in Oakwood Cemetery in Niagara Falls. Nine years after his death, Porter’s beloved Black Rock was annexed to a thriving, expanding Buffalo. Black Rock became a neighborhood in the City of Buffalo. The next time you’re driving down the 190 along the Niagara River or driving through Black Rock, think about Peter Porter and what our region might look like if we lived in the City of Black Rock and the Erie Canal went from Lake Erie to Lake Ontario! Courier Express, July 24 1938, sec 6, p.4. Grande, Joseph. Peter B. Porter and the Buffalo Black-Rock Rivalry. Buffalo and Erie County Historical Society Publications.